Latest « Revro – New & Used Industrial Equipment, Service and Spare Parts. We have had an increasing number of our clients requesting Chalmers and Corner spare parts for presses and press brakes. We hold a large inventory of spare parts for these Chalmers and Corner presses and press brakes. Plant acquisition allows us to offer many genuine and reconditioned parts. Additionally, our experience & expertise enables us to manufacture hard to get spare parts to client specification or from our extensive drawing and machine history portfolio, producing quality parts in timely fashion to minimise your equipment down-time. Revro can service all types of equipment, both large and small, either on-site or at our factory. Expensive downtime warrants a call to us. Our client base ranges across Australia, New Zealand, Malaysia, China, Thailand and the Pacific. We provide emergency breakdown response and routine or preventative maintenance, including comprehensive inspection reporting. We can remove and re-install your equipment. Additional services include clutch and brake conversions, guillotine blade changes and sharpening, bar cropper repairs, and so on. Revro can design comprehensive, pro-active maintenance programmes for your manufacturing facility or for an individual machine to protect your investment and lengthen its lifespan. We also have in stock or can manufacture spare parts for a wide range of other manufacturers. We also have a number of PRESSES for sale. Vibro Dynamics: Vibration isolation and shock control. Machinery mounts and vibration isolation systems. Revro is the Australian and New Zealand representative for Vibro Dynamics and their range of Machinery mounts and vibration isolation systems for Vibration isolation and shock control. Since 1964, Vibro/Dynamics Corporation has been the leader and pioneer in the design and manufacture of vibration isolation and shock control systems. Their Products are designed to effectively reduce transmitted shock and vibration and to provide an adjustment means to precisely level, align, and properly support industrial machinery. Vibro Dynamics and Revro also provide systems that protect machinery and building structures from incoming vibration caused by machinery, railroads, earthquakes, etc. Whether it’s a heavy blanker or forging hammer disturbing the neighbours, an injection molder or die caster that likes to walk, or equipment or structure that needs protection, Vibro/Dynamics and Revro have the best solution for you! We have a wide selection of used equipment for sale. Some of the equipment we have is below, and if what you are after is not listed please give us a call and we will be happy to help. Comprehensive Inspection Condition Reports on all machines can be performed if requested. Stock does change, so please phone to determine availability. A sample of our current stock is pictured but it is not exhaustive. We would welcome the opportunity to supply ex stock or source your requirement via our worldwide contacts. At Revro, we can perform pre-purchase, pre-removal inspection assessments should you purchase used machinery elsewhere. We can also remove and re-install at your site – anywhere in the world. Equipment offered is available in a range of conditions – as is, where is, with all faults if any; repaired or modified to meet your requirements; fully reconditioned; reconditioned & modernised; complete with clutch & brake conversions. Coil Handling – Ward Engineering 8 Ton x 48″ Uncoiler. 4 leaf mandrel motorized expansion. Miscellaneous – Birlec Electric Furnace. Type PHW 18.10kW.3 Phase.415V.Max Temp 1000 Cen. We have recently completed a full press inspection report and removal of a Bliss Welded Products Model S2-250-84-48 (weight 35 tons) and a Bliss Welded Products Model S2-350-84-48 (weight 44 tons). 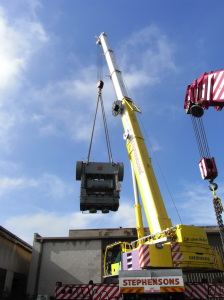 We removed all power, air supply, clutch and brakes units, guarding and other equipment before the lift and managed cranes and transport. 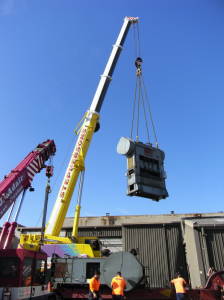 A challenging site required the removal of the roof to allow for the presses to be lifted out with a 130 ton crane with a 20 ton Frana assisting in an adjacent yard to load on a flat deck for interstate transport. The 250 ton Bliss Welded Products press was transported interstate and the 350 ton Bliss Welded Products press was transported to the Revro factory to repair the Bliss clutch and brake unit, increase shut height (daylight) by 5″ and manufacture new tie rods to accommodate longer tie rods (to allow common dies to be used during manufacturing). 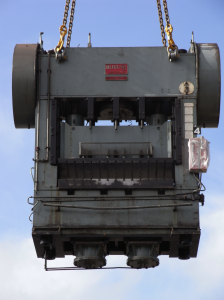 As a separate project we removed a Wilkins & Mitchell 150 Ton 2 Point Gear Eccentric Press.